A thriving creative class is a key feature of nearly every successful modern city. A vibrant culture is not only valuable in its own right, it also often serves to attract and inspire talented workers in non-creative fields, creating a rising tide that benefits the entire city. However, that very same rising tide often lifts housing costs and other living expenses, which consequently puts a strain on the budgets of those creative workers. This is the 2015 edition of SmartAsset’s study of the best cities for creatives. Read the 2016 version here. Indeed, the financial realities of creative fields such as dance, photography and music often mean that creatives cannot afford to live in many of the places where they have historically had the most success and influence. Cities like New York and Los Angeles have, simply put, become too expensive for many working artists. If you still want to save up to move to one of these cities, think about meeting with a financial advisor. Avoid the coasts. Zero West Coast cities and just one East Coast city ranked in the top 10 in SmartAsset’s analysis. Durham, North Carolina was the only coastal city to score well for both affordability and culture. Are the new creative capitals in the South and Midwest? Nine of the top 10 cities for creatives in SmartAsset’s study are located in one of these two regions. If housing prices and the cost of living in cities like San Francisco and New York continues to climb, more and more creatives may head for the heartland. 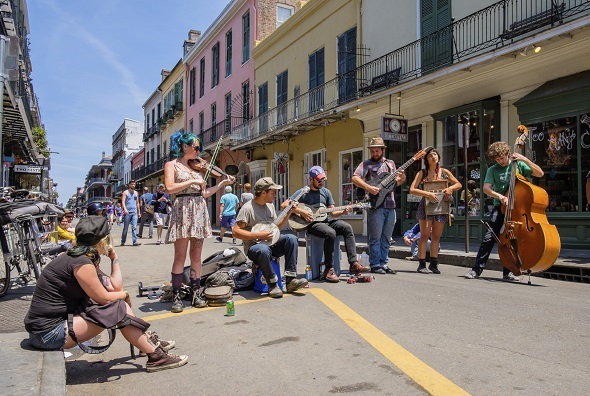 The birthplace of jazz, New Orleans has long been considered one of the country’s best cities for musicians seeking inspiration and an audience. While it remains one of the world’s top music cities, it has emerged as a great place for all kinds of creatives. Indeed, going by total employment, the single largest creative profession in New Orleans is acting. There are 1,900 full time actors or actresses in New Orleans, according to the Bureau of Labor Statistics. The only western city to crack the top 10, Salt Lake City scored well for both its low cost of living and the high number of professionals in creative fields in the area. 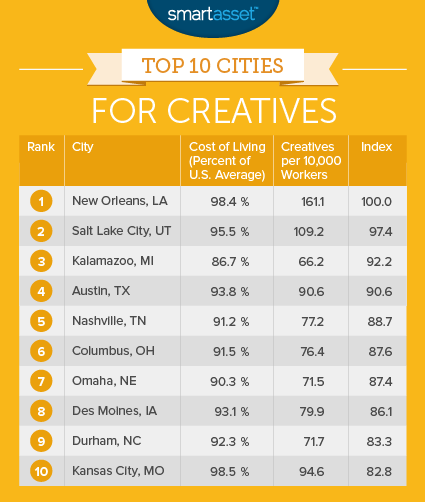 The Salt Lake City metro area has the 11th highest concentration of creative professionals of any U.S. metro (there are over 400), with 109 creatives for every 10,000 workers. Try SmartAsset’s free mortgage calculator. These jobs are supported by a strong arts scene, with a premier art museum in the Utah Museum of Fine Arts, a world-class ballet company in Ballet West and numerous annual music and art festivals like the Living Traditions Festival and the Utah Arts Festival. Salt Lake City is also one of the screening locations for films participating in the Sundance film festival, widely considered to be one of the best independent film festivals in the world. In many cities, creatives have to take on a second job or a “day job” in order to pay the bills, focusing on their art (or music or writing or photography) in the off-hours. In Kalamazoo, such a trade-off may not be necessary. The city’s cost of living is 15% lower than the national average and half the cost of living in New York and Los Angeles. Nonetheless, the city still has a rich creative culture. With two local institutions of higher education (Western Michigan University and Kalamazoo College), as well as the Arts Council of Greater Kalamazoo, creatives in the area likely have no trouble finding support and inspiration in the local community. Austin is not only the political capital of Texas, it is also the Lone Star State’s creative capital. Indeed, the city’s official slogan is “Live Music Capital of the World.” (“Keep Austin Weird” is the unofficial slogan.) While Austin does indeed have some of the world’s best live music venues and performers, the city’s creative culture goes much further than that. Along with the inimitable street art and two world-famous music and film festivals, Austin also has one of the country’s best independent book stores (Book People) and one of the world’s premier literary and cultural archives (the Harry Ransom Center has 1 million rare books, including a Gutenberg Bible). 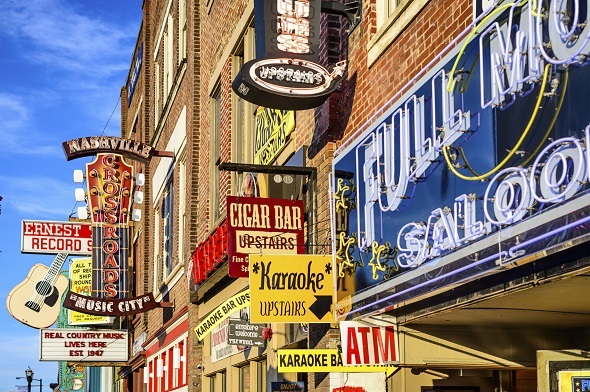 While outsiders often associate Nashville with country music, the city’s cultural life goes far beyond twang and honky-tonk. The Nashville Opera, the Nashville Symphony and the Nashville Ballet are a few of the city’s leading cultural institutions. A number of local colleges and universities, including Vanderbilt and Tennessee State, also provide support for the arts. Combine that with a cost of living that is 8.8% below the national average and Nashville presents a great setting for creatives. Historically, universities have been the primary incubators of the arts, providing stable teaching jobs to artists in a variety of fields who can perfect their craft and pass on their knowledge to their students. In addition to Ohio State, the Columbus area is home to more than a dozen colleges and universities, including the Columbus College of Art and Design. The city also has eight museums, including the expanding Columbus Museum of Art (a new wing is set to open this fall). Many who work in creative fields struggle to make ends meet. Those who work full-time as an artist, musician or writer may not have sufficient income to cover rent and other basic expenses. In Omaha, where median rent for a one bedroom home is just $686 per month (according to rentjungle.com), artists will likely face less financial stress. On top of that, local organizations like the Omaha Creative Institute offer resources to help creatives build their careers so they can stop worrying about their income and focus on their trade. The cost of living in Des Moines is 6.9% lower than the national average and more than 20% lower than the cost of living in Chicago. At the same time, Des Moines ranks 34th in the U.S. out of more than 400 metro areas for its concentration of creative professionals. There are about 80 people working in creative fields in Des Moines for every 10,000 workers in the wider economy. The Durham Performing Arts Center opened in 2008 and is among the largest such centers in the U.S. It hosts hundreds of events and performances every year, including the American Dance Festival, one of the premier dance festivals in the world. Durham is also home to a music scene that boasts a number of independent record labels, including Merge Records, and has produced multiple national acts over the past decade. Kansas City has emerged in recent years as a creative hub to rival those in the northeast and on the West Coast. The city’s Crossroads Art District has gained national recognition for both its growth and the quality of its offerings. Crossroads alone has more than 70 art galleries, to go along with larger institutions like the Nelson-Atkins Museum of Art and the Kemper Museum of Contemporary Art. To find the best cities for creatives, SmartAsset gathered data on 176 of the largest cities in the country. We considered two factors in our analysis: the cost of living and the concentration of people working in a creative field. In total, we included 28 different occupations in this calculation, as defined by the Bureau of Labor Statistics: Art Directors; Craft Artists; Fine Artists, Including Painters, Sculptors, and Illustrators; Multimedia Artists and Animators; Artists and Related Workers, All Other; Commercial and Industrial Designers; Floral Designers; Graphic Designers; Interior Designers; Set and Exhibit Designers; Designers, All Other; Actors; Producers and Directors; Choreographers; Music Directors and Composers; Musicians and Singers; Entertainers and Performers, Sports and Related Workers, All Other; Editors; Writers and Authors; Sound Engineering Technicians; Photographers; Film and Video Editors; Dancers; Fashion Designers; Reporters and Correspondents; Art, Drama, and Music Teachers, Postsecondary; Curators; Architects. Lastly, we averaged these scores and indexed the results to 100: the city with the highest average scored an overall 100, while the city with the lowest average scored a zero. Cost of living data used in our study comes from the Council for Community and Economic Research. Jobs data comes from the Bureau of Labor Statistics. Read the 2016 version of SmartAsset’s study of the best cities for creatives.